Really cool dinosaurs - Dinosaur toys that come alive from Papo. If Really Cool Dinosaurs are What You Want then PAPO is Where You Go! PAPO Dinosaur Toys are Cool Dinosaurs. Ever on the lookout for Cool Dinosaurs I was wandering through a local toy shop during the early Fall of 2006. The leaves were falling, the air crisp, and on the shelf, looking down at me with little eyes bright and shining was the finest Dinosaur Toy model I had ever seen. The Papo Velociraptor, clearly hungry, could not take its eyes off me, nor I him. There were two, plus two equally beautiful Tyrannosaurus right there next to them. Price was no object here! Based upon the Jurassic Park movie dinosaurs this French based company had produced two of the absolutely most startlingly gorgeous theropods I had seen in fifty plus years of collecting. Truly Cool Dinosaurs! In addition, their little lower jaws dropped, just like mine. 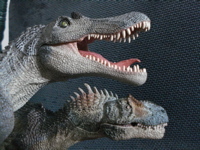 The hinged jaw adds an "action figure" aspect and added realism to these great dinosaur figures. Back in mid-October I had a very interesting experience with the Papo Parasaurolophus. Here is the relevant blog entry. Cool Dinosaurs. Instant Collectibles. Great Toys. Over the last few years (there really only have been a few since 2005) PAPO has been adding several new cool Dinosaurs to their plastic paleontology on a regular basis. You can buy PAPO Dinosaurs on Amazon by clicking here. With special thanks to Hotaling Imports for their generosity in helping with this page. The Allosaurus (2008) A Great Toy! Despite their French pedigree these dinosaur toys are all made in China. If You Get Only One Toy Dinosaur in Your Life Get the Papo Allosaurus!